Italy rescues 2,000 migrants from sea Jump to media player The Italian coastguard has embarked on one of its biggest ever migrant rescue missions. Italy calls for action on migrants Jump to media player Italy says the international community must find a solution to the chaos in Libya if it wants to reduce the flow of migrants trying to reach Europe. Fleeing from Libya - eight months pregnant Jump to media player As migrants continue to risk life and limb to reach Europe from Africa, Libya has become the main hub for traffickers plying their illegal trade in human cargo. Migrants 'packed like sardines' Jump to media player Brigadier Martin Xuereb describes one migrant rescue off the coast of Malta. Why is Med so deadly for migrants? 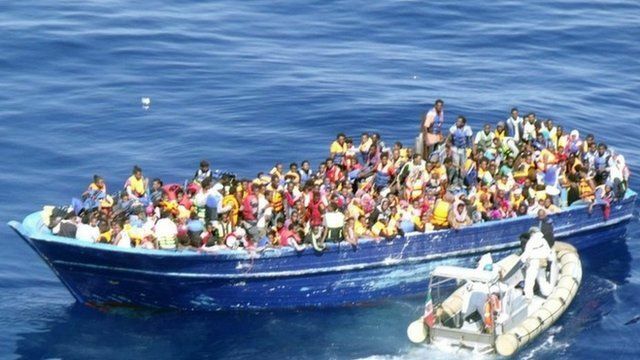 Jump to media player Thousands perished trying to reach Europe in 2014 - BBC News asks why the crossing is so deadly. What drives migrants to risk lives? Jump to media player Middle East correspondent Quentin Somerville speaks to migrants in Misrata on the Libyan coast. How Italy copes with migrant influx Jump to media player The BBC's Tom Burridge reports from the Italian island of Lampedusa, where authorities are struggling to cope with a huge influx of new migrants. The Italian coastguard has embarked on one of its biggest ever migrant rescue missions. Officials say they co-ordinated the rescue of more than 2,000 migrants in waters off the coast of Libya. The operation was launched after distress calls were received from 22 overcrowded boats and inflatable dinghies.